t*rexes and tiaras: Laura Ashley Love.. It's no secret that I am a huge fan of Laura Ashley. An iconic, British brand which I've grown up loving (I have my mother to thank for that! ), I'll take any opportunity to add to my collection. If I'm totally honest, the past 18 months or so haven't seen the release of any pieces which have *really* appealed to me, but when I saw the SS14 lookbook, I knew that this was about to change. 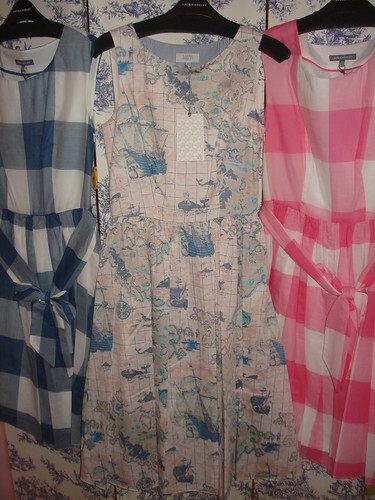 Laura Ashley styles seem to have returned to the archetypal cotton 50s frocks, which are right up my street. I was very excited to see some of the dresses I've been waiting for hit the site last week, and lost no time in placing an order, which I picked up on Wednesday from my local store. I posted here about the new collection pieces and what I had my eye on. 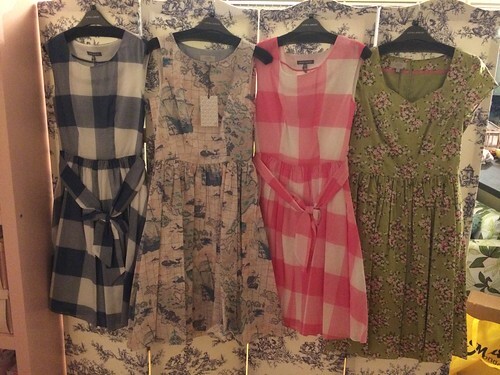 I knew that the checked dresses and the map print dress had to be mine. 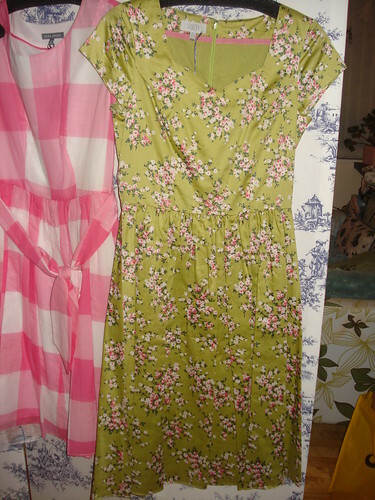 The green floral dress is one which I didn't spot in the lookbook, but noticed on the site a couple of weeks ago and promptly added to a wishlist post. It's an archive print (I love that Laura Ashley reinvent their archive prints for new pieces) and is made in a really pretty cotton sateen, which has a lovely sheen to it's finish. 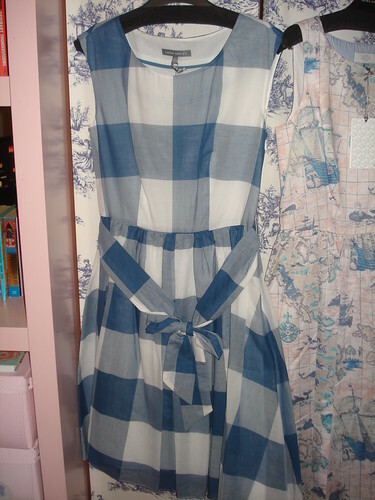 The blue checked dress is very very similar indeed to the one which was released in 2010, although a little lighter shade of blue. I know it was a popular style back then. Part of me thinks that there may have been a red version, but I can't find anything about it online, so I may be getting it confused with this rose print one, which was the same style. I loved my old navy check dress, so was really pleased that this one will make a decent replacement, as that one no longer fits me at all. The pink one is (obviously) the same, but just as pretty in my opinion. I am really jumping on the gingham bandwagon lately and the large checked print on these makes me think of summer picnics. They are both cotton again, with fully lined skirts as well as bodices. Last but not least, the piece de resistance. I knew that I needed to make space in my wardrobe for the map print dress just as soon as I saw it. I hadn't realised how pink the background was (I'd though it was more of a creamy-beige when I saw it on the lookbook), so that was a pleasant surprise. The fabric print has a checked grid background, which makes me think of old maps and the main print is such a pretty treasure map. Pirates, whales and ships, oh my! I seem to be saying this an awful lot, lately, but could the warmer weather get a move on? Now all I have to do is decide what to wear them with. Which is your favourite? Are you a Laura Ashley fan, too? Well, it is a lovely skirt - all the gingham at the moment is brilliant. I really couldn't resist the map print. Thanks, I can't wait for some nice weather to wear that one! I've been waiting for the map dress too, but of course it would become available at a time when I can't afford to buy it! Just crossing my fingers that it doesn't sell out too quickly, but I have a feeling it will! I'm hoping not, but it does seem to be on every blogger's wishlist at the moment, like the Nancy Boden dress. I think the map dress is my favourite but it's a close call. 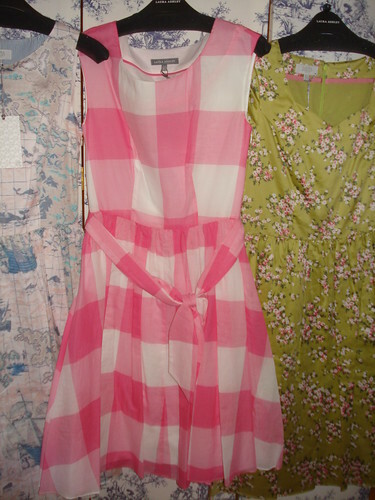 the gingham is such a classic, I was so glad to see that they were bringing it back! These are all so beautiful, I wish I could afford to buy all of them!